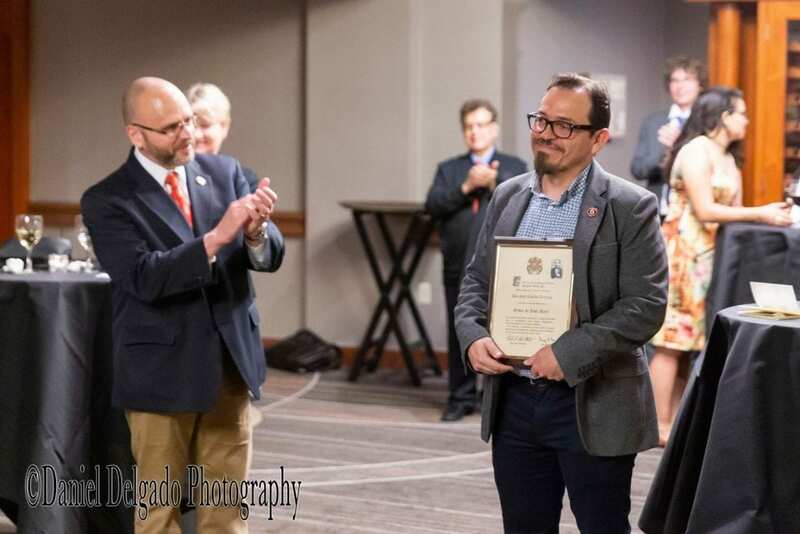 On April 12, 2019 during the National Collegiate Hispanic Honor Society’s reception at the 72nd Annual Kentucky Foreign Language Conference in Lexington, Kentucky, Professor Raúl Carrillo Arciniega was inducted in the Order of José Martí, one of the Society’s highest honors. Dr. Carrillo Arciniega’s exceptional contributions to Hispanism earned him this international distinction. Professor Mark P. Del Mastro’s essay “Sigma Delta Pi and the AATSP: A Shared Century of Leadership and Collaboration” has been published in the March 2019 issue of Hispania. This “Special Note” connects to Dr. Del Mastro’s ongoing research for his book Sigma Delta Pi: Rediscovering a Century (1919-2019) that will be published by Juan de la Cuesta Hispanic Monographs in 2020. On Wednesday December 5, 2018 at 7:00pm at the Spanish Benevolent Society in New York City, Professor Mark P. Del Mastro will address the North American Academy of the Spanish Language as invited speaker for his formal admission as a “miembro numerario”/full member of the same academy. Dr. Del Mastro’s presentation “Sigma Delta Pi y su historia en la vispera de su centenario (1919-2019)”/”Sigma Delta Pi and its history on the eve of its centennial (1919-2019)” will be based on his forthcoming book Sigma Delta Pi: Rediscovering a Century (1919-2019) to be published by Juan de la Cuesta Hispanic Monographs in late spring 2020. All three finalists will be recognized and the awardee announced during a ceremony on Thursday, November 16, 2017 in Alumni Memorial Hall at the College of Charleston in Charleston, S.C. Each finalist will receive an award plaque courtesy of the College of Charleston’s and The Citadel’s chapters of Sigma Delta Pi, and each finalist and their guests will enjoy complimentary lodging the evening of November 16, 2017 and breakfast on November 17 courtesy of the Francis Marion Hotel in downtown Charleston. Sigma Delta Pi’s 2017 S.C. Spanish Teacher of the Year will also receive a $500 cash award courtesy of D. Virgil Alfaro, III, M.D., The Citadel class of 1984. All questions regarding the contest should be forwarded to Dr. Mark P. Del Mastro, Founding Director of Sigma Delta Pi’s South Carolina Spanish Teacher of the Year Award, College of Charleston: delmastromp@cofc.edu. The Nu Zeta Chapter of Sigma Delta Pi, the National Collegiate Hispanic Honor Society, was among 12 of the 613 chapters of Sigma Delta Pi nationwide to receive the Honor Chapter award for outstanding activities executed during the 2016-17 academic year. This was the 7th consecutive year that the College of Charleston received this prestigious recognition, to coincide with the chapter’s 40th anniversary (1977-2017). Drs. Susan Divine and Carmen Grace of Hispanic Studies are Nu Zeta’s chapter advisers, and along with past student chapter president Maya Novák-Cogdell, they were instrumental for this national recognition. At the 70th Annual Kentucky Foreign Language Conference, April 20-22, at the University of Kentucky, Dr. Carl Wise presented his study “Pirates, Empire, and National Identity in Lope de Vega’s Dragontea” and Dr. Mark P. Del Mastro organized and directed the 15th annual Informative Session of the National Collegiate Hispanic Honor Society. The College of Charleston’s and The Citadel’s Chapters of Sigma Delta Pi, the National Collegiate Hispanic Honor Society, named Clover High School‘s Stephanie Schenck the 2016 Sigma Delta Pi’s S.C. Spanish Teacher of the Year. The awards ceremony was held at 7:15pm in Alumni Hall at the College of Charleston. Also recognized were finalists Loyda McClellan of Fort Dorchester High School and Kathleen Stafford of Irmo High School. All three finalists were presented award plaques courtesy of the College of Charleston’s and The Citadel’s chapters of Sigma Delta Pi, and each finalist and their guests enjoyed complimentary lodging the evening of November 10, 2016 and breakfast on November 11 courtesy of the Francis Marion Hotel in downtown Charleston. Sigma Delta Pi’s 2016 S.C. Spanish Teacher of the Year, Stephanie Schenck, also received a $500 cash award courtesy of D. Virgil Alfaro, III, M.D., Citadel class of 1984. 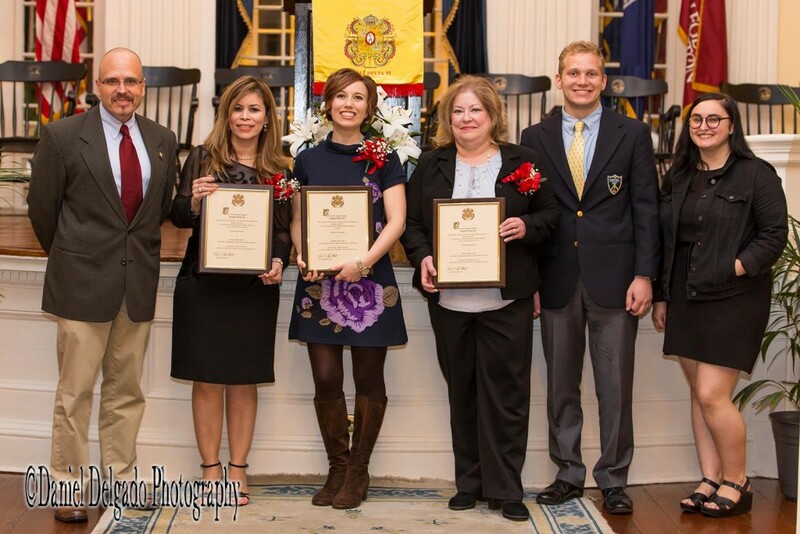 The three finalists (center) of Sigma Delta Pi’s S.C. Spanish Teacher of the Year with Dr. Del Mastro (left) and the chapter presidents of The Citadel’s and Cof’C’s chapters of Sigma Delta Pi. Maya Novák-Cogdell, student president of the College of Charleston’s Nu Zeta Chapter of Sigma Delta Pi, the National Collegiate Hispanic Honor Society, has been selected to present in Sigma Delta Pi’s national “Best Practices Session” to be held during the 99th Conference of the American Association of Teachers of Spanish and Portuguese from July 6-9, 2017 in Chicago, Illinois. All three finalists will receive award plaques courtesy of the College of Charleston’s and The Citadel’s chapters of Sigma Delta Pi, and each finalist and their guests (one guest per finalist) will enjoy complimentary lodging the evening of November 10, 2016 and breakfast on November 11 courtesy of the Francis Marion Hotel in historic downtown Charleston. The 2016 S.C. Spanish Teacher of the Year will receive a $500 cash award courtesy of D. Virgil Alfaro, III, M.D. ’84.